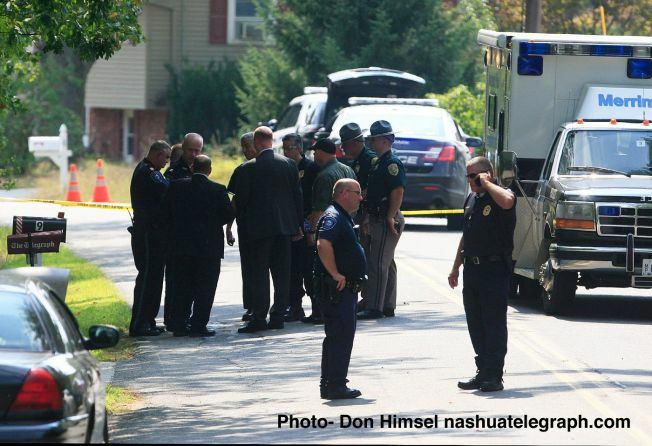 A photo of the shooting scene in Merrimack, New Hampshire. A New Hampshire police lieutenant was justified in shooting a suspect to death in Merrimack two months ago, state prosecutors proclaimed Thursday. Attorney General Joseph Foster has determined that the officer was acting within the law when he shot down 23-year-old Harrison Lambert on Sept. 3. Lambert was accused of threatening his father, Gregory Lambert, with a knife. The suspect's parents told investigators he had suffered from mental illness, and that his condition had worsened in the days before the shooting. Gregory Lambert told officials his son responded to the 911 call by saying he was "not going down easy." Harrison Lambert was shot five times. He died from his injuries the following evening.